Graeme John Ogilvie was born on 23 November 1924. 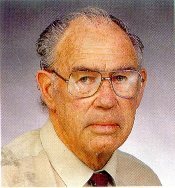 He obtained a Bachelors degree in Metallurgical Engineering and a Master of Engineering Science with First-Class Honours, both from the University of Melbourne, both in the 1940s, supported by a Stawell Research Scholarship from the University. He was then awarded a CSIR fellowship to undertake research for a PhD degree at Leeds University, UK. Ogilvie has a deep knowledge in the fields of metallurgy and physics, of which he makes use with great imagination and originality of thought. The work initiated by Ogilvie has now led to a new method of preparation of surfaces. He is a source of enthusiasm and inspiration to those working with him. I think the new field he has opened up will prove very important and have wide applications. This work has become one of our major projects. It is a new field with important applications, some of which have already aroused considerable interest by industry. The progress is dependent on Ogilvie’s versatility and his ability to delve into a subject in which neither he nor any of us previously had any experience. The work had a significant influence on the development of ion implantation procedures for the production of solid-state electronic devices, and also was important in the theory of radiation damage. In 1966, workers in the UK had proposed optical fibres for transmission of enormous amounts of information. However, impurities in glass fibres limited transmission distances to a few metres. Graeme realised that certain organic liquids, such as tetrachloroethylene, could be relatively easily purified and he conceived the concept of a liquid-filled hollow fibre. He designed and built a machine capable of producing such fibres in excess of one kilometre in length, and developed appropriate practical terminals and signalling equipment to demonstrate the practical potential of his system. This resulted in a number of patents taken out by CSIRO and joint project work between CSIRO, AWA Ltd, and The Australian Postmaster General. In spite of the world leading achievements resulting from Ogilvie’s research, CSIRO did not support any further activities in this field. The two collaborating partners, however, continued their work in this area. Graeme’s work was the catalyst for the substantial Australian optical fibre cable industry, which exists today. The original fibre-pulling machine developed by Graeme for his fibre optics research was later installed at Scientific Glass and Engineering Pty Ltd, where it was used to manufacture glass capillary columns for gas chromatographs, an Australian product exported worldwide. Having been told that he should change his research activities, Graeme, moved on to study the electric arc. Working with two colleagues and a small budget, he came up with a unique method for controlling a pulsed current applied to an electric arc which led to the development of Synchro-Pulse CDT (Controlled Drop Transfer) welding system. The importance of this achievement was recognised by Welding Industries of Australia Pty Ltd (WIA), who signed an agreement with CSIRO in 1981 to develop a device which was widely adopted in Australian manufacturing and fabrication companies and has been sold to most countries of the world. This system is still in wide use throughout the world. Graeme was always rather disparaging of bureaucracy and organisation. However, when Dr RH (Bob) Brown was appointed to form the Division of Manufacturing Technology in 1980, it became very clear that Graeme had the leadership qualities ideally suited for establishing a unique path to industrial research outcomes. His past scientific achievements assured respect by all staff and his enthusiasm for attacking the interface between scientific investigation and industrial practice provided effective motivation for industrial achievement. His wide knowledge and wisdom rapidly convinced industry partners of the real advantages of working in close collaboration with researchers. He strongly pushed the view that CSIRO should work WITH, rather than FOR industry and he encouraged the concept of industry/research teams, which change membership as innovations move to the market. Graeme was appointed Assistant Chief of the Division of Manufacturing Technology; Officer in Charge of the Melbourne Laboratory and Research Leader of the Arc Technics Group. He served in these roles until his retirement from CSIRO in November 1989.
a plasma device which allows material to be injected into the centre of the plasma arc. Throughout his career Graeme Ogilvie demonstrated a very broad understanding of physics and engineering and he combined this with an understanding of practicalities, leading to scientific and technological achievement. For many years Graeme, with his wife and their son and daughter, ran a small farming venture at Romsey, undertaking the many challenges thrown up in that environment – including repairing a broken tendon on a sheep! After leaving CSIRO he and Pixie sold the farm and moved to Ocean Grove where they have happily spent the last 12 years enjoying country and beach life. Graeme has been active with his own research company and with affairs in the local community. One activity has been making picture frames for paintings by his wife Pixie and an Ocean Grove art group. He died at his home at Ocean Grove during the night of 28-29 January 2001. He was 76. In a long and fruitful life, Graeme contributed much to science, engineering and innovation. He displayed great leadership and humanitarian qualities. A sympathetic listener and a lateral thinker; he was usually able to propose a wise solution to most difficult technical or personal problems. He was elected a Fellow of the Australian Academy of Technological Sciences and Engineering in 1992 and was awarded one of the three inaugural CSIRO Medals for Research Achievement in 1985.
by the publication in 1997 of the book, Research Development and Innovation (Brown RH, Carter AR, Davie RS, Ogilvie GJ, Engineers Australia Books, Crows Nest, NSW), with Graeme as one of the four authors. Brown RH, 2009, Personal communication.